South Carolina has not adopted or made available a definition of college and career readiness. South Carolina state policy allows students to earn dual credit for academic or CTE postsecondary courses taken at their high school, a postsecondary institution, or virtually. All public postsecondary institutions in the state are required to accept dual-enrollment credits (ECS, 2015). The Middle College National Consortium has partnered with institutions of higher education in South Carolina to provide two Early College High School programs as part of the Early College High School Initiative (ECHSI). The Gateway to College National Network has partnered with an institution of higher education to provide an Early College High School program as part of ECHSI (Jobs for the Future, n.d.). South Carolina organizes its secondary CTE programs in 15 Career Clusters based on workforce requirements and the National Career Clusters Framework. 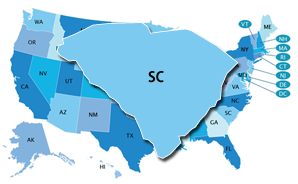 South Carolina maintains programs of study that span from secondary to postsecondary in each of the Career Clusters except for Government & Public Administration (NASDCTEc, n.d.). In South Carolina, the Individual Graduation Plan (IGP) is a student-specific educational plan detailing the courses necessary for the student to prepare for graduation and to successfully transition into the workforce or postsecondary education. South Carolina's IGP is mandated by the state. It includes all students in Grades 8–12. South Carolina’s state-specific Early Warning System is called the Student Potential Performance Snapshot (SPPS). Early Warning System data are reported at the state, regional, district, school, and student levels to school administrators, counselors, and educators.